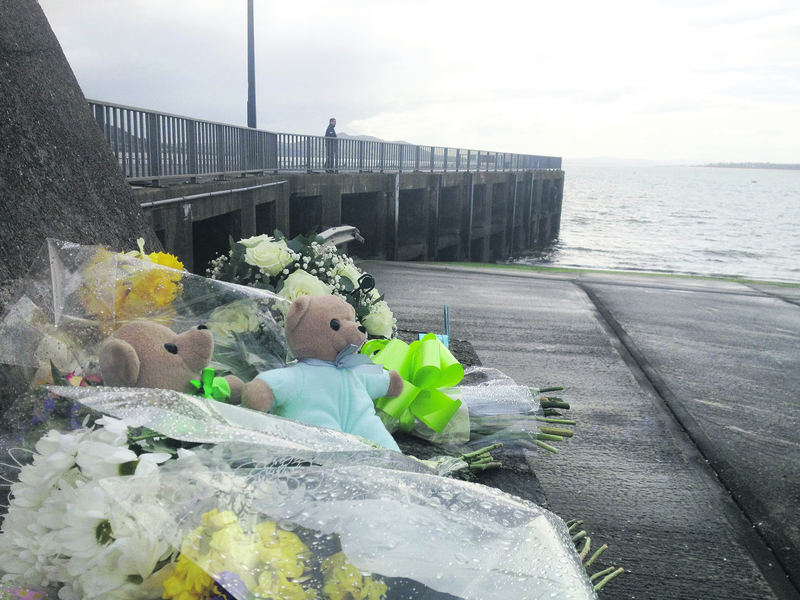 Flowers and other tributes laid at the slipway at Buncrana Pier following the drowning tragedy in March 2016. IT IS of ‘grave concern’ that the doors of the Buncrana Pier Tragedy victims’ car could not be opened by emergency workers. The revelation came at a pre-inquest hearing in Buncrana Courthouse last week. 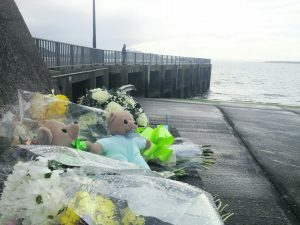 Five members of a Derry family, including three children, drowned on 20 March last year when their car – an Audi Q7 – entered the water at Buncrana pier. While the full inquest into the deaths of the victims – Sean McGrotty (49), Mark (11) and Evan McGrotty (8), Jodie-Lee Tracey (14) and Ruth Daniels (59) – is not due to take place until November, the tragedy was discussed at the latest sitting of the Coroner’s Court in Buncrana last week. Barrister Keith O’Grady, representing the late Mr McGrotty’s insurance company said it was a matter of ‘grave concern’ that the car doors could not be opened in the normal manner from the outside by members of the emergency services at the scene. The coroner’s court also heard how the pier slipway was ‘slippery’ on the evening of the tragedy and that Allianz Insurance has commissioned its own report in relation or the slipway and any issues regarding the surface or access to it. Full story in this week’s Inishowen Independent.